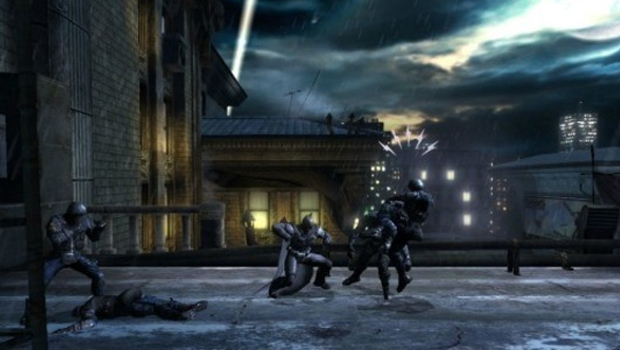 Batman: Arkham City offered 3D support on Xbox 360 and PlayStation 3. The assumption would be the feature gained little fandom; recently released Arkham Origns does away with 3D all together. Arkham, however, is not built for 3D. It’s mood and gothic style dims imagery across the nighttime adventure. TVs prone to cross-talk are suffocated in those conditions. There is 3D light for 2013 Batman games, and it exists on the 3DS. Blackgate is a follow-up to Origins’ storyline, a 2.5D platform title in the vein of Metroid, “Metroidvania” if you prefer the popular terminology. Blackgate is successful in bringing a traditionally third-person franchise into the frame of a 2D adventure. It uses the traditions of flat 2D space but expands into the background and foreground, making it a breeding ground for stereoscopic potential. Blackgate itself stretches into a foggy horizon line which makes for some outstanding depth as Batman patrols outdoor areas. Inside, where most of the game takes place, tattered metal barbs stretch in different directions to create foreground elements. Working through numerous vent systems, forced camera angles work to stretch material toward the viewer and create a superb sense of pop. Ripping off grates with a Bat Claw, the moody hero tosses the metal toward the screen. In all of this, it is important to note how well considered the depth is, with a focus on layering. While still dim with its lighting, cross talk is infrequent. Rarely is Origins draped in total darkness, and considering the subject matter, lighting is intense. It’s bright enough to swell 3D depth and make the feature appealing. Origins’ lacking quality (in 3D) are the motion comic cinemas which seem terrified to apply 3D pressure. If you need 3D Batman this year, Origins is your only choice. Thankfully, it works. Zen Pinball 2 marks a PlayStation 4 milestone: The first stereoscopic 3D game to be available for Xbox One OR PS4.